At Online Pokies you'll find information based only on the facts so you can learn everything there is to know about pokies. We cover the history of slot machines in Australia and New Zealand as well as how they work, how to play, frequently asked questions and more. Pokies come in a wide variety of different line layouts, jackpot types and game themes. Check out the Most Popular Games and enjoy unlimited free play on all of the games. Try our our Game Finder if you're looking for a particular game or type of game. There is a lot of misinformation and myths when it comes to poker machines. Our guides are based on the facts and cover everything you need to know if you're going to play offline or online. There is a lot of misinformation found both online and offline about how the pokies actually work. We give you the real information, show you what's inside of every game and how the outcome of every spin is decided. While there were slot machines in Australia as early as the 1900's it was not until 1956 when the government of NSW decided to legalize the one armed bandits for use exclusively in registered sporting clubs. 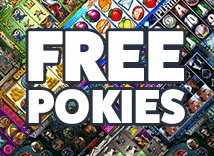 The word "pokies" is Australian slang for slot machines. They can be a range of different gaming machine types but today the most popular and widely found variety are five video reel, multi-line slot games all of which have a bonus game of some sort. The most frequently seen bonus game is the chance to win free spins where wins are usually multiplied. The games also typically have a gamble feature where you can try to increase your winnings by selecting either red or black (Double) or the suits (Quadruple). These Australian style machines have become very popular in casinos around the world and online due to the fact that they offer a much more entertaining experience compared to the older style spinning reel slot machines. The biggest companies in the pub, club and casino markets in Australia and New Zealand are Aristocrat, IGT and Ainsworth. The main software providers online are Microgaming, Playtech and Net Entertainment with lots of new and impressive game titles to choose from.